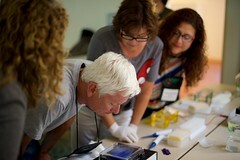 The Bio-Link community works together to improve workforce education in bioscience and biotechnology. As a Bio-Link member, you're able to connect and collaborate with other members of the community to create new opportunities for students, learn new skills and content knowledge, and contribute to tools and materials that support teaching and learning. Joining Bio-Link gives you a chance to shape the future of bioscience workforce education. Bio-Link offers memberships to both individuals and organizations. Faculty-Administrators: To become a Bio-Link faculty-administrator member, you must complete the membership application for Bio-Link faculty and provide a school email address that we can use to verify your position at a college, university, or high school. Affiliates: An affiliate membership is perfect for students who have graduated from a Bio-Link college program and wish to remain connected to Bio-Link. To become an affiliate member, complete the Bio-Link application form for Affiliate members. Students: To become a student member, complete the Bio-Link application form for students. Colleges that have bioscience workforce oriented programs: To join Bio-Link as a college program, we ask that you first read about the characteristics of a Bio-Link program, then complete the Bio-Link program information form. We will use the information you provide to create a page on the Bio-Link site and set up memberships for your faculty. High school affiliates: To become a Bio-Link high school affiliate, we need you to complete the high school affiliate program information form. Industry - organizational affiliates: To become an industry or organizational affiliate, we ask that you complete the industry - organization affiliate form. This option is also appropriate for grant projects. Membership in Bio-Link is currently free, however all memberships must be renewed on an annual basis. Renewals take place in the fall.